1 King size bed, 2 Sofa beds. Accomoddation for 6 people in total. 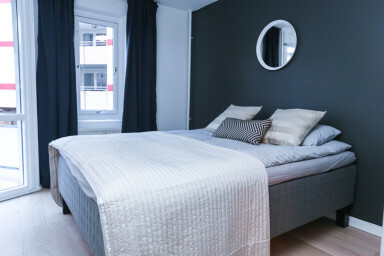 This property is close to the Oslo Central Station, Metro station, Opera house, Karl Johans street, Grunerløkka, Bjørvika, Sørenga Sjøstrand, Youngstorget, Domkirken, Olympen, Dattera til Hagen, Asylet. This property is good for couples, solo adventurers, business travelers, families (with kids), and big groups. This property is 9 minutes walk from the beach. The property is 200 m from Oslo Central Station / Bus Terminal and guests benefit from private parking and free WiFi available on site.